Are you in pain and not able to get better, please see one of our physiotherapists. We have a team of very experienced physiotherapists ready to help you with a mixture of treatment and rehabilitation exercises and advice. Our physiotherapists are used to both acute and chronic problems and link the muscles to the bones in their treatments. Our dedicated physiotherapists believe in taking their time with a comprehensive evaluation of functional limitations and areas of pain. Our physiotherapists will then design a treatment plan to tailor your specific needs and goals for better getting on with your work and personal life - and sporting life. We take a team approach and can consult with your employer and sports coach should you wish. Our team consists of highly skilled experts in different areas such as physiotherapy, osteopathy, soft tissue work, acupuncture, rehabilitation exercises and other complementary therapies. Member of the Chartered Society of Physiotherapy, HCPC registered. Susana is an experienced Musculoskeletal Physiotherapist with a strong background in injury rehabilitation. Her interest in Physiotherapy and Sports Medicine started at a very early age, whilst she was training in the Spanish National tennis team, where she spent a lot of her time receiving treatment for different injuries. Susana obtained a Bachelor’s degree in Sports Medicine in 1995 whilst representing an American University tennis team. Spent the next few years assessing and managing sports related injuries, getting athletes back to their sport safely. Later on qualified as a Physiotherapist in London to become more competent treating a wider range of patients, not to be confined to treating athletes or sports injuries. For the last few years she has developed my expertise in treating a wide variety of patients and conditions. She listens to ner patient’s needs very carefully, addressing the causes of their injury as well as their symptoms to produce a diagnosis and treatment tailored specifically to their needs and goals. In her practice, she uses manipulation/mobilisations techniques, trigger point therapy, tapping, muscle energy techniques, adverse neurodynamics combined with rehabilitation exercise programs for patients to return to their work, sport or hobby as soon as possible. Postgraduate courses include, Acupuncture, advanced spinal manipulation techniques, K tapping, Functional Movement Screening, myofascial release and pain management. She truly enjoys working with her patients, being 100% committed to help them achieve their goals. Susana is registered as a physiotherapist with all major health insurances but not BUPA and AXA/PPP who in 2016/7 are reducing benefits per treatment and not allowing their members to top up. This will not make it viable for most clinics in Central London to work with them. We are therefore restricting our BUPA treatments to one osteopath, Tracy Davies and one physiotherapist, Robert Galloway until further notice. AXA/PPP have reduced their benefit to a level that makes it impossible for us to work with them. Rob is a state registered Physiotherapist with over ten years of musculoskeletal experience practicing in corporate and private physiotherapy clinics, now exclusively in the Central London Osteopathy and Sports Injury Clinics. He is not an ordinary physiotherapist, but using a broad range of treatments such as soft tissue work, massage, mobilising, manipulation, ultrasound, acupuncture, stretching and strengthening to release stiff joints, regain muscular strength and balance, aid healing of strained or sprained muscles and ligaments, also to mobilise bound neurological structures with the aim of restoring pain free movements of the body so you can return to your work sport or leisure activities as soon as possible. Pilates based core stability exercises, ergonomic advice and aids, coupled with rehabilitation exercise programmes are given to strengthen the body and alter habits, which may cause re-injury with the aim of making the effect of the treatments long lasting. Post graduate courses include Acupuncture, Applied Kinesiology, Myofascial work and Cranial Sacral systems in order to offer treatment when required which taps into the subtle systems in the body with the intension of releasing, unblocking and allowing the body to return to healthy patterns of being. Rob is a registered physiotherapist with all the major private health insurances incl. AXA PPP BUPA. Member of The Chartered Society of Physiotherapy. Qualified in physiotherapy in 2003, he decided to further improve his treatment skills by becoming an osteopath as well. He is one of the very few in UK to have this treatment combination. His background as a semiprofessional football player in Spain gives him the first hand insight into sports injuries and training, which is one of the areas, where Central London Osteopathy and Sports Injury Clinics excel above most. Chris is registered with all the major private health insurances but not BUPA and AXA/PPP who in 2016/7 are reducing benefits per treatment and not allowing their members to top up. This will not make it viable for most clinics in Central London to function. We are therefore restricting our BUPA treatments to one osteopath, Tracy Davies and one physiotherapist, Robert Galloway until further notice. AXA/PPP have reduced their benefit to a level that makes it impossible for us to work with them. Susana Tous, physiotherapy in London: Member of the Chartered Society of Physiotherapy, HCPC registered. Susana is an experienced Musculoskeletal Physiotherapist with a strong background in injury rehabilitation. 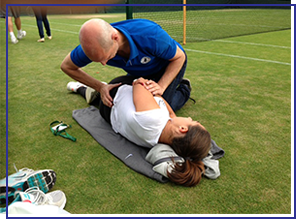 Her interest in Physiotherapy and Sports Medicine started at a very early age, whilst she was training in the Spanish National tennis team, where she spent a lot of her time receiving treatment for different injuries. Susana obtained a Bachelor’s degree in Sports Medicine in 1995 whilst representing an American University tennis team. Spent the next few years assessing and managing sports related injuries, getting athletes back to their sport safely. Later on qualified as a Physiotherapist in London to become more competent treating a wider range of patients, not to be confined to treating athletes or sports injuries. For the last few years she has developed my expertise in treating a wide variety of patients and conditions. She listens to ner patient’s needs very carefully, addressing the causes of their injury as well as their symptoms to produce a diagnosis and treatment tailored specifically to their needs and goals. In her practice, she uses manipulation/mobilisations techniques, trigger point therapy, tapping, muscle energy techniques, adverse neurodynamics combined with rehabilitation exercise programs for patients to return to their work, sport or hobby as soon as possible. Postgraduate courses include, Acupuncture, advanced spinal manipulation techniques, K tapping, Functional Movement Screening, myofascial release and pain management. She truly enjoys working with her patients, being 100% committed to help them achieve their goals. Susana is registered as a physiotherapist with all major health insurances but not BUPA and AXA/PPP who in 2016/7 are reducing benefits per treatment and not allowing their members to top up. This will not make it viable for most clinics in Central London to work with them. We are therefore restricting our BUPA treatments to one osteopath, Tracy Davies and one physiotherapist, Robert Galloway until further notice. AXA/PPP have reduced their benefit to a level that makes it impossible for us to work with them. .
Ange-Elie is a therapist with 2 MA's, one in Sports Sciences and the second in Physiotherapy and functional rehabilitation. He obtained both with honours, and has a strong knowledge in applied anatomy, biomechanics, physiology and nutrition. Sportsman since little, he tried himself many activities such as athletics, gymnastics, motocross, dance, yoga and Pilates. His main sport, though, is football, and he plays at a semi-professional level, understanding therefore the sportsworld and expectations as well as the setbacks/injuries through my own experienced eyes. What can our physiotherapists offer you? Physiotherapists give individualized treatment of an injury or disability based on scientific knowledge, a thorough assessment of the condition, environmental factors and lifestyle. Pain is your body's way of telling you that something is wrong. It is often caused by swelling of tissue, which creates pressure on nerves and leads to discomfort. This is important to know as pain is a useful mechanism to alert you to a problem, and stops you from damaging your body further. It should always, therefore, be taken seriously. Pain can affect many areas of the body, but particularly the lower back, head, neck, joints and legs. It can result from injuries and arthritis, and can also manifest itself in the form of rheumatic pain and period pain. Physiotherapy is a health care profession directed at evaluating, restoring and maintaining physical function of the body. Also known as physical therapists, physiotherapists have a detailed understanding of how the body works and our physiotherapists are specially educated and trained to assess and improve movement and function and relieve pain. Physiotherapists promote good health by encouraging their clients to improve and increase control over their own lives. How do I find the best physiotherapy clinic in London? To find the best physiotherapist in London for your back pain, sciatica or other injury you should first ask your friends or colleagues who the think is their best physiotherapist in London . You can also look up in google search for positive reviews and that way find the best physiotherapy clinic in London according to other users experiences. To find the best physiotherapist in London by looking at the website of the physiotherapy clinic itself can also give good hints although you must be aware that it has been written by the physiotherapist himself with one of the main aims of letting you know that he is the best physiotherapist for you - and we are no different to all other physiotherapists in London on that point. But please give us a call on 020 7739 5666 because it is impossible to say who is the best physiotherapy clinic in London - but we promise that our physiotherapists are very experienced, hands-on and will do their very best for you. We have been going since 1991 and literally handpicked our physiotherapists one by one.